Apply immediately after done cleaning/stripping the wood. Do not allow the wood to dry! Take extra care to pre-rinse vegetation. Apply Deck Brightener following manufacturer's directions. Most brighteners can be applied with a pump-up sprayer. The brightener should dwell on the wood for 5-15 minutes. Makes sure that you mist the deck with water if it starts to dry. Use protective clothing, glasses, and gloves. We sell environmentally friendly products but they can still cause a reaction to skin and eyes. When done take time to rinse the wood, home, vegetation, cleaner residue, grime, and wood fibers. 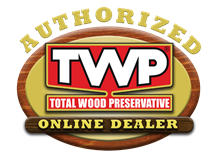 Wood should dry for 48 hours prior to a TWP Stain application. I finished stripping a few days ago but haven't yet applied the brightener and I'm about to go out of town for a week. Is it ok to apply the brightener now and apply stain 10 days later when I'm back in town? I installed pressure treated would last year. I applied a cleaner and rinsed with a power washer. Four days later I applied a brightener. I noticed that there are wood fibers or fuzzies sticking up on the wood. Is it ok to sand at this stage prior to application of TWP stain? 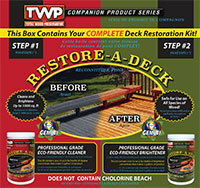 Yes but rinse the deck after with water well to remove any sand dust. I stripped my deck last week, and didn't have time to apply the wood brightener. Then it rained a few days. Can I still apply wood brightener? The wood doesn't look grey, it's a natural color, it's 4 years old, so in good shape. Yes you still can and should.